This week, from September 12th - 15th, the FIBES Conference Center in Seville, Spain will host a meeting for Europe's top educators during the twenty-ninth annual conference of the European Association for International Education (EAIE). This international initiative was started as a non-profit project in 1989 with the aim of becoming a point of dialogue and shared work for higher education professionals and institutions. According to the organization's estimates, the gathering will attract more than 5,500 people to the Andalusian capital. Throughout the week, university representatives from more than 85 countries will attend information sessions, discussions, webinars, receptions and conferences. On the occasion of this event, Loyola University Andalusia, the Jesuit university of Seville, has joined forces with the newly-organized International Association of Jesuit Universities (IAJU) to promote collaboration and exhibit the universality of the values of justice, dialogue and work at the service of others that inspire Ignatian education. Under the guidance of Rev. Michael J. Garanzini, S.J., the General Secretary of Higher Education for the Society of Jesus, the IAJU seeks to create common lines of work and projects that involve the whole Jesuit educational community, from students and teachers to administrators. In light of its proximity to this year's EAIE gathering, Loyola University Andalusia has become a host for its sister Jesuit universities, through setting up a series of activities and simultaneous events to enrich the experience of those in attendance. 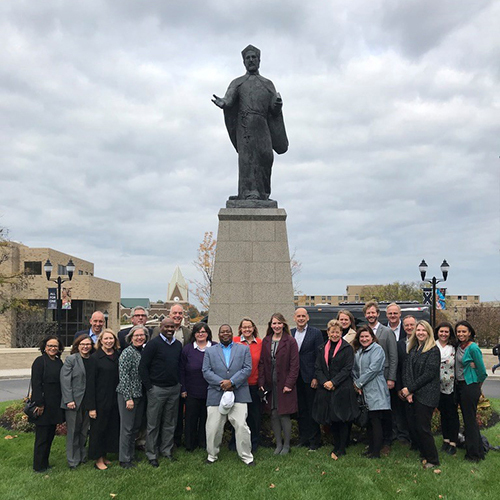 A broad range of American Jesuit colleges and universities will have representation at EAIE: Loyola University Chicago, Marquette University, Fairfield University, Le Moyne College, Saint Louis University, University of San Francisco, Xavier University and Loyola University New Orleans. He adds, “specifically for Loyola and the International Association of Jesuit Universities, it is an exceptional opportunity to exhibit the differentiating elements of Jesuit education, which are a benchmark in the search for values of justice, development, sustainability and reconciliation. We have chosen as a slogan a classic phrase used since the days of St. Ignatius that has always been a maxim of the Society of Jesus: ‘The world is our home.'" Students and administrators from Loyola University Andalusia at EAIE 2017.